Carte des Pays Bas Catholiques. This is a beautiful 1702 map by Guillaume De L'isle depicting the area now covered by the southern Netherlands, Belgium and Luxembourg. Also includes parts of neighboring Germany and France. The map extends from Rotterdam south as far as Reims (Rheims) in France, and from Boulogne-sur-Mer (Boulogne) east as far as Cologne in Germany. The regions of Flanders, Artois, Hainault, Namur, Brabant, Luxemburg, Liege, Limburg, Gelder, Holland, Juliers, Cleves and Zeeland are included. Renders the entire region in extraordinary detail offering both topographical and political information with mountains and forests beautifully rendered in profile. The Low Countries were on the low-lying delta formed by the convergence of the Rhine, Scheldt, and Meuse rivers. 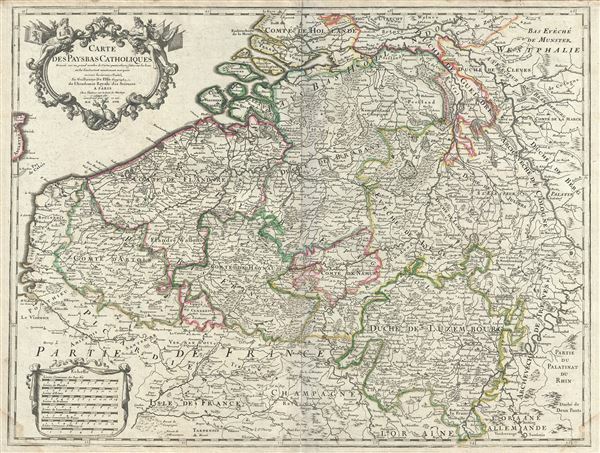 This map was made after the end of the Eighty Years' War (1568-1648) when the Low Countries were divided into the United Provinces and Southern Netherland. This portion of the Netherlands was known successively as the Habsburg Netherlands, the Spanish Netherlands, and finally Austrian Netherlands until in 1795, Napoleonic forces invaded and set up a new French client state, the Batavian Republic. The Low Countries, until 1581 part of the Seventeen United Provinces, were reunited by the 1815 Congress of Vienna as the United Kingdom of the Netherlands. The United Provinces hosted the world's first stock exchanges, and is considered the birthplace of the modern capitalist economy. A beautiful title cartouche adorns the top left quadrant. This map was issued by Guillaume De L'isle in 1702. Very good. Original platemark visible. Some centerfold verso repair and reinforcement. Minor damp stains lower left and right margins. Blank on verso.